This detached house used to be a one up, one down cottage but it has now been considerably extended. 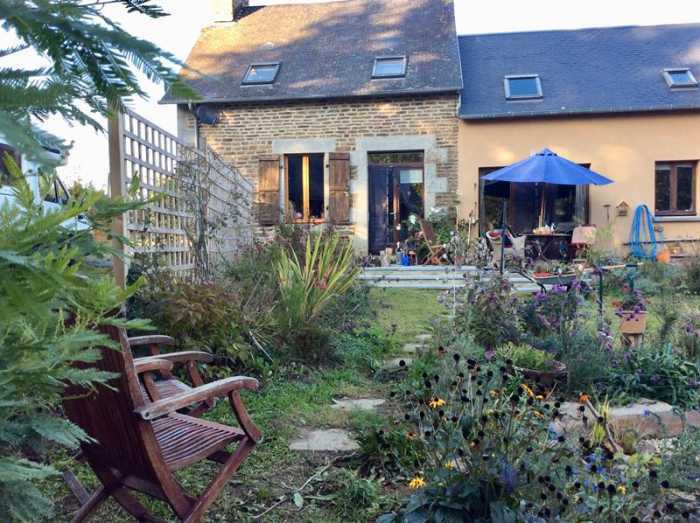 The original part is now a self-contained gîte which gives home and income opportunities. There is a connecting internal door to the main property which is in the extension. The property benefits from double glazed windows throughout and over the last 4 years the whole of the main property has been finished to provide cosy family accommodation which is versatile and light. A particular feature of the property is the landscaped garden. Viewing is highly recommended. St Martin De Landelles is in the Manche area of Normandy. The closest airport to St Martin De Landelles is Dinard Airport (66 km) and Rennes Airport (67 km). Around St Martin De Landelles attractions such as as Mont St Michel (26 km) and the Ange Michel Leisure and Water Park, and the lakes at Vézins are about 1km away. In season you will find camping, boats and fishing. The town of Saint Martin de Landelles is about 3kms from the house and has facilities including a bakery, post office, supermarket, butchers, school, newsagents, hairdresser, petrol station and a garden centre, 2 bars and a restaurant. Utility room : 5.03m x 3.83m - 1/2 glazed door and window to the front elevation. Range of matching base and wall units. Ceramic sink with mixer tap. Worktops. Space and plumbing for dishwasher and washing machine. 2 built in cupboards - one housing hot water cylinder and electrics. Cloakroom : Vanity unit and WC. Workshop/Hobby Room/Study : 5.03m x 2.72m - Glazed French doors to the front elevation. Permission to create 2 velux windows. This room could be converted into a ground floor bedroom and there is space for an en-suite bathroom. Hatch to loft storage space. Landing : Velux window to rear elevation. Master Bedroom : 3.78 x 3.20 - Velux windows to the front and rear elevations. 2 windows to east elevation. Wood floor. Exposed "A" Frame. Sloping ceilings. Electric radiator point. Bedroom 2 : 3.06 x 1.80 - Velux window to the rear elevation. Wood floor. Sloping ceiling. Electric radiator point. Bedroom 3 : 2.86 x 1.54 - Velux window to the front elevation. Built in wardrobe. Wood floor. Sloping ceiling. Electric radiator point. Bathroom : Velux window to the front elevation. Heated electric towel rail. Bath with mixer tap/shower and shower screen with tiled surround. Pedestal hand basin. WC. Sloping ceiling. Open plan living room/kitchen : 5.80m x 5.72m - Glazed double French doors and window to the front elevation. Tiled floor. Fireplace with woodburner. Cupboard housing electrics. Electric radiator. Stairs to first floor. Corner kitchen with range of matching base and wall units. Space for freestanding cooker with extractor fan over. Space for undercounter fridge. Space and plumbing for washing machine. Worktop with inset single stainless steel sink and mixer tap. Door to extension. En-suite shower room : Velux window to the front elevation. Corner shower. Toilet. Electric radiator. Pedestal hand basin. Cupboard housing hot water cylinder with shelving over. Sloping ceiling. The garden is a particular feature of the property with a large south facing terrace, ornamental pond and a variety of flower and shrub beds and borders. The remainder is laid to lawn and there is a timber double car port (6.69m x 5.57m) with attached wood shed/store (6.69m x 2.30m). Mains water, electricity and telephone are connected. Drainage to an all water septic tank. Electric heating and 2 woodburners. Broadband internet connection. Please note : Whilst the Energy Report has been carried out to the property in accordance with current legislation there is no rating as the owner was not able to supply the last 3 years energy bills.